Been relying on chilled store bought drinks. Please do yourself a favour by making some fresh, healthy drinks at home that are free of preservatives, artificial sweetners, additives and flavourings. Our grandparents (read as ancestors) knew better. They looked out for natural body coolants and used them to make delicious drinks to beat the summer heat. They used ingredients like green gram, finger millet, kokum, hibiscus flowers, sesame seeds, poppy seeds, musk melons, fresh fruits to make delicious drinks. These juices are quick and easy to make and won’t take a lot of your time in kitchen to make. You can make a big jug of these juices, chill them and gulp them down the whole day. That’s what we do in our family. In our homes we make one kind of juice everyday and enjoy it throughout the day. Keep your body cool through these natural coolants. 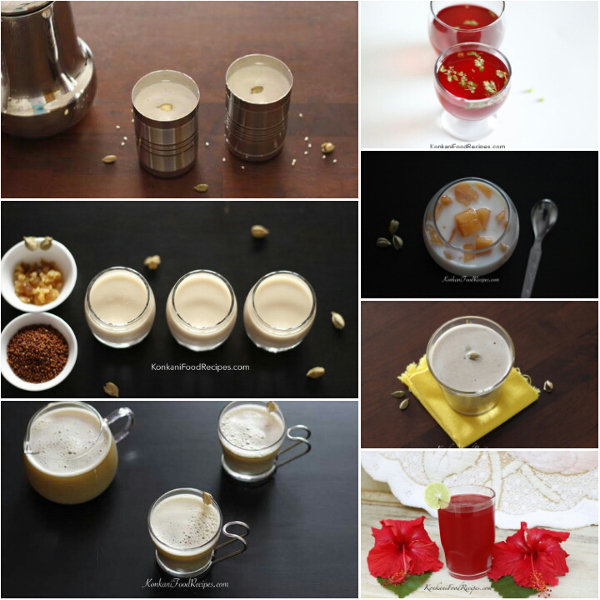 Do give these delicious drinks a try. Also, keep yourself hydrated, have coconut water, cucumbers, buttermilk, watermelons, muskmelons as much as possible. These are common body coolants that should be had abundantly during summers. If not blend in some fresh fruit juice quickly in the kitchen and keep yourself hydrated and nourished. You can make some mint lemonade, mango juice, chikoo juice, watermelon juice, grape juice at home super quick. You don’t have to fret in the kitchen. These fresh fruit juices are easy to make and are so good for you.